Phoenix is the capitol city of Arizona and is a growing metropolis. With about 3 million people living in Phoenix, it stands as the largest city in Arizona, and 6th overall in the nation. “The Valley,” as some call it, is quite literally a large valley surrounded by mountains. Activities range throughout the valley from museums to parks to sports games. In about 700 A.D., Hohokam Indians who moved north from Mexico, arrived in the Salt River Valley. The Hohokam mastered a prehistoric canal system, the most extensive in the world, and grew cotton and barley. The Hohokam stayed for about 700 years leaving for unknown reasons in 1400. Jack Swilling paid a visit to Smith in September of 1867. Swilling was an ex-confederate, Indian fighter, adventurer and prospector. Swilling saw the ancient canals and realized the potential of them. Swilling went to Wickenburg, AZ where he rounded up a group of supporters and $400 and set out to Phoenix. Swilling created the Swilling Irrigation Canal Company. In December of 1867, Swilling and 16 others arrived at Smith’s Station. They began digging canals and cleared out the ancient canals. In March of 1868, wheat and barley crops were growing and the population was 50. Swilling’s Ditch, also called Town Ditch, ran for less than a mile near current day Tempe. At first, the canals were used for lots of different things, not being the cleanest water. However, it would later become one of the biggest irrigation projects in the world. At present day 24th St. and Washington, in 1868, Frenchy Sawyer established the first more permanent farm. By 1870, the census recorded 164 men and 61 women, 96 of whom were farmers; no doctors, bankers, teachers, just farmers. On October 20, 1870, a group of citizens met up to select a site for the town. The first proposed site was near present day 16th St. & Van Buren, the second at 32nd St. & Van Buren, and the third between 7th Ave. and 7th St. Phillip D. Duppa (a supposed lord who was exiled from Britain) wanted the 3rd proposed site. He also had built a home in the early 1870’s which still stands as the oldest structure in Phoenix. Swilling wanted the 32nd St site and when the committee chose the 7th Ave & 7th St site, he was upset and in frustration shot a ‘bird-shot’ which accidentally hit someone who voted against him. Lots of land in the new town ranged in price from $20 to $140. The first sold was $103 and sat at today’s 1st St & Washington. The new town had a location, but now it was time to choose a name. Names like Stonewall, Millville, Pumpkinville and Salias were all thrown around. It was thought that Duppa came up with Phoenix. Swilling claimed he had found it first in the dictionary, but either way, the name was fitting because a civilization rose from the ashes/ruins of the prehistoric peoples. On October 26, 1870, Phoenix became a city. Maricopa County was established in 1871 and Phoenix was chosen as the county seat. The election for the first sheriff was quite interesting. Two candidates got in an argument, in which one ended up shot dead and the other was asked to leave. The 3rd candidate (Jim Barnum) won by a vast majority. In 1879, the first ice-making plant was opened by Sam Lount. Sold at 7 cents a pound, the ice was necessary to bear through the hot summers. In 1880, the population was 1,708 and still growing. Since Phoenix sat between two transcontinental railroads, it appeared as if it would remain a small farming town. However, the arrival of William J. Murphy in 1885 changed that. Murphy began building the 35 mile long Arizona Canal, which would connect with the original canals. Murphy’s wife, Laura, supervised construction while Murphy himself traveled back East to raise money for the massive project. The project was quite expensive and resulted in quite a debt for Murphy. Right on time though, the very first water flowed through the canal in June of 1887. At this time, with a much larger irrigation system, agriculture could really take off. Murphy established the Arizona Improvement Company, which connected all four canals and reduced water loss and sped up delivery times. Before this time, it was only Tucson and Prescott that competed for the capital, however now, Phoenix could. In 1864, Prescott had become the first territorial capital, but it was moved to Tucson in 1867. In 1877, it was moved back to Prescott. In 1889, Phoenix won over the capital by just one vote. One story goes that the night before the big vote, a Prescott Delegate went to the red light district to visit one of his “ladies.” He had a glass eye and took it out and placed in in a glass of water that night. During the night, his “friend” was thirsty and drank the water. In the morning, with his glass eye gone, he felt too embarrassed to go to the vote. Prescott was just one vote shy, but Phoenix proved victorious. Legislatures met and in 1901, a capitol building was dedicated on Washington Street. The building stands today with a huge copper dome and a weather vane called “Winged Victory”. “Winged Victory” was secured in the 1960’s, however she was freed again after they decided it was okay for her to swing freely around. There is a free museum that is worth a look at the capitol building today. Water was still an issue at this time and big floods in 1890 and 1891, followed by long droughts, severely impacted Phoenix. Some left while others stayed. In 1902, in need of help, Arizona turned to Washington D.C. The passing of the National Reclamation Act chose Phoenix and the Salt River Valley as the first water reclamation project. In 1911, Theodore Roosevelt Dam was completed providing the ever important water as well as electricity to Phoenix. In 1926, the Federal government authorized the funding of highway paving in Arizona. Before this, many roads were old wagon trails used by the military, stage coaches, and freight transportation. The Vulture Road, which connected Phoenix, Wickenburg and Prescott, became the U.S. 60 and AZ-89. The Black Canyon Road, created in the 1860’s, headed north to Prescott. The I-17 follows a part of this (other parts can be seen from the road). A stage on the Black Canyon Road to Prescott was 140 miles and left Mondays, Wednesdays, and Fridays. This was the 10 hour shorter and $12.50 cheaper way then the Vulture Road route, however, attacks by bandits and Indians made this a dangerous route. Stages were frequently robbed on the old, rough, and dangerous wagon roads. In 1929, there was less than 300 miles of paved roads in Arizona, hence the federal funding. Two Interstates met in Phoenix in the 1950’s. Loops were completed connecting numerous freeways, and the railroad also arrived. Major freeways include the I-17, I-10, AZ-51, and Loops 101, 202 & 303. Phoenix has continued growing to this day. Advances in technology have allowed for life in the desert to prosper. Numerous dams provided essential water also. Phoenix is home to A.S.U. (Arizona State University), as well as the Phoenix Coyotes, Phoenix Suns, Arizona Cardinals and Arizona Diamondbacks. Between Phoenix and its many suburbs, there are tons of recreational activities, making this city the main hub for activities. 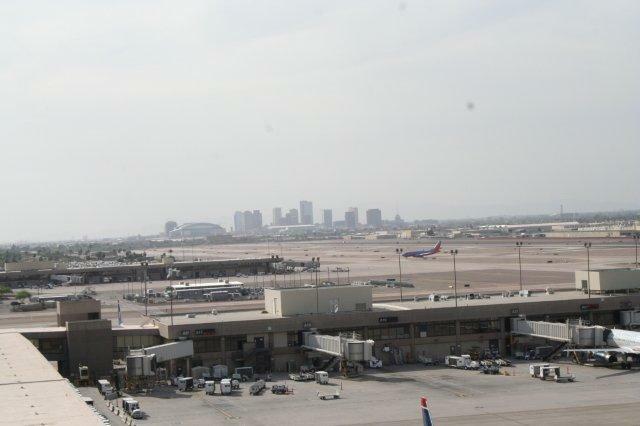 Home to Phoenix Sky Harbor International Airport, as well as the major business center, Phoenix is by far the hub of activities. This is Phoenix, a great valley where the sun shines 85 percent of the time, a very different world from the prehistoric Hohokam who first inhabited the area. Trimble, Marshall. Roadside History of Arizona. 2nd edition. Missoula, Montana: Mountain Press Publishing Company, 2004. 180 - 195. Print.